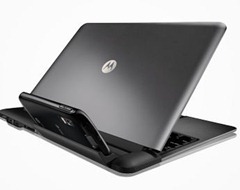 The first product that gets quite close to the vision is the Motorola Atrix 4G. It’s a super-duper dual-core screamer with great screen, extras like a fingerprint scanner..etc – but none of that really matters, as such specs will no doubt will be superseded in the non-stop mobile arms race. What matters is the docking station – which is a laptop. Or to be exact, a shell of the laptop: keyboard, display, battery. In other words, peripherals: the computer is the smartphone itself. This is your personal computing nirvana vision ?